Today the whole western world is mesmerised by Hindu weddings, right from Katy Perry/ Russell brand to Elizabeth Hurley/Arun Nayar many Hollywood celebrities have come all the way to India to get married according to the Hindu faith. So what is it about Hindu marriages that have managed to capture the interest of the whole world? Well, there are many things that are unique about Hindu marriages in India; the aplomb and fanfare that surround a typical Hindu wedding are just phenomenal, together with the colourful and glitzy wedding attires of the bride, groom, and guests. It would not be wrong to say that typical Hindu weddings are an extravaganza of colors, where the red color dominates above all. There would be no need to elaborate the significance of the red color in an auspicious ceremony like a wedding. Traditional Hindu brides wear red color as it is said to be the color of suhag. It signifies passion too. Also associated with the Goddess Shakti, it is said to drive away evil and therefore its liberal use on an auspicious occasion like wedding. Right from the tilak applied on the groom's forehead, the vermillion put on the bride's hair, to the bangles on her wrists, to the alta applied on her palms and feet, to her bindi the list is just endless. Other than red, there are many other colors that play an integral role in a Hindu wedding setting. Saffron is another color that dominates in a Hindu wedding. Walk into any wedding venue where a traditional Hindu marriage is scheduled to happen, you will surely notice the liberal use of saffron colored marigold garlands for decoration. These signify loyalty and are again considered auspicious. Saffron color also denotes purity. Another color that dominates the Indian wedding setting is Gold. From the golden embroidery in the attires worn by the groom/bride to the Gold ornaments without which any traditional Indian wedding is considered incomplete the golden color rules this auspicious occasion. 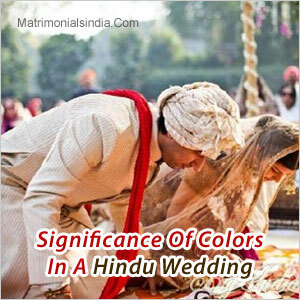 Hindu weddings are indeed replete with myriad colors and all these colors have their own meanings and significance. The use of these rich colors makes this auspicious event even more bright and cheerful.